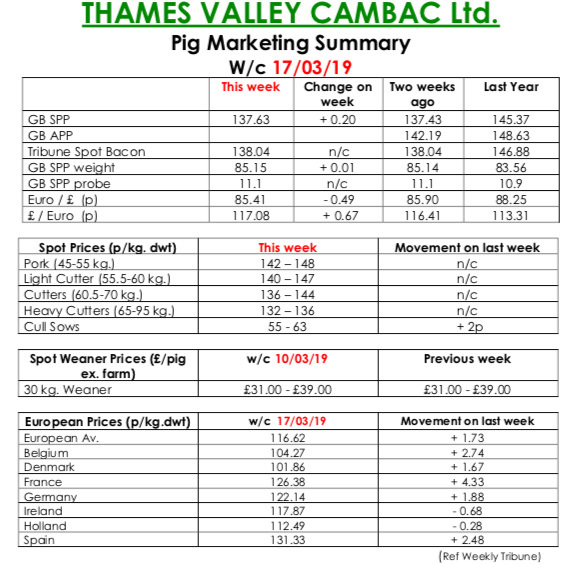 This week’s Pig Marketing Summary from Thames Valley Cambac reported that damage caused by storm Gareth curtailed processing at one major causing pigs to be rolled down and out of this week. Supply volumes, however, remained manageable, although weights on some farms continue to be stubbornly high. Demand was fickle with some processors cutting their kills again. Prices however were a strong stand on, with all contract contributions the same as previous and the SPP increased for the first time in 8 months. The fresh meat market saw little noticeable uplift despite the promotional efforts of National Butchers Week, and demand remained weak. 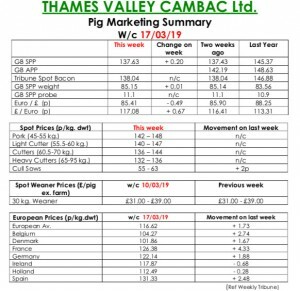 The cull sow market held top spot again with prices increasing 2p on the back of better continental trade. In Europe, good gains were seen in many countries, including France up six euro cents, Belgium and Spain up four, and Germany up three. Price quotes in sterling were tempered however by the continuing weakness in the Euro that ended the week down 0.49p at 85.41p. The Weaner Marketing Summary, for week commencing March 10, reported that demand continued to improve, and supply generally matched. Recent production reports indicate improvements in weanings in all systems. However, the current inclement weather may put pressure on outdoor units. The prices announced by the AHDB saw the weighted average for a 30kgs store pig quoted at £45.85, and the weighted average for a 7kg weaner fall by 24p to £35.15.